A 19-year-old Arizona State University student died after being shot multiple times while waiting at a red light, authorities told ABC15 in Phoenix. On Saturday, just before 3 p.m., two cars collided near the intersection of Broadway Road and McClintock Drive. 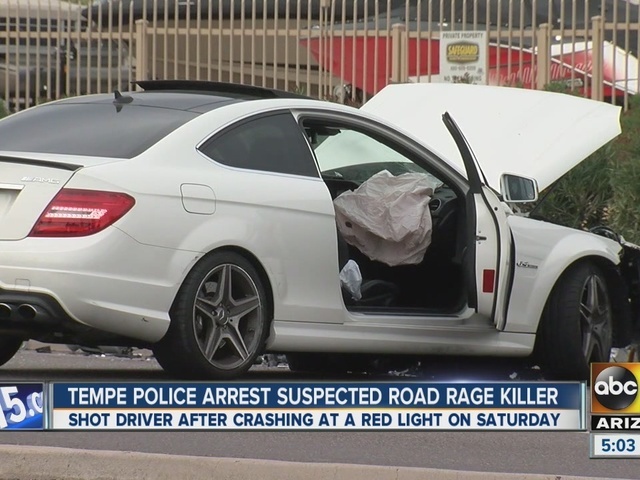 Yue Jiang, who was driving a Mercedes, was shot by 32-year-old Holly Davis after the two were involved at a minor fender bender crash, Tempe police said. Jiang's 21-year-old boyfriend walked out of the Mercedes to assess the damage when he saw Davis had a gun. 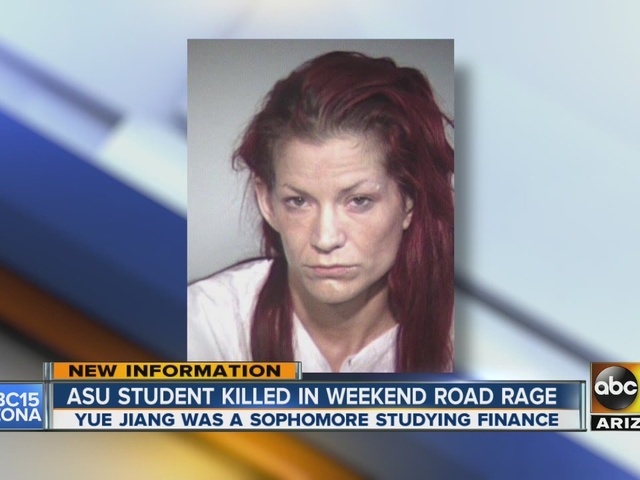 The Tempe Police Department told ABC15 that Davis walked to the driver side of Jiang's vehicle and shot multiple times through the window. Jiang lost control of her vehicle because of her injuries and collided with a third car that was carrying five passengers. 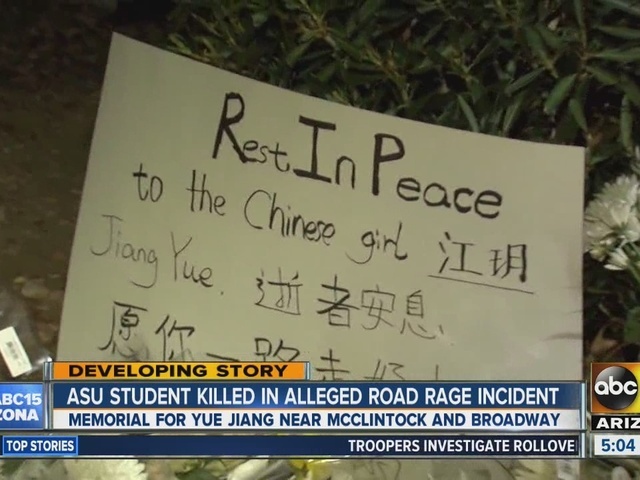 Jiang, a 19-year-old international student from China, passed away from her injuries at the hospital, Tempe police confirmed. Police tracked down Davis after she fled from the scene. She was located in a Mesa home where police said the woman was not remorseful, not cooperating with police and would not admit to the shooting. Davis was positively identified after witnesses took down her license plate which matched the car description that was given to police. She's being charged with first-degree murder, aggravated assault with a deadly weapon, disorderly conduct with a deadly weapon and prohibited possessing. "This just amounts to Holly Davis doing a completely senseless violent act which resulted in the death of Yue Jiang," Tempe Officer Naomi Gilbraith said. Jiang's boyfriend sustained minor injuries. The five passengers who were injured are family members, including a pregnant woman and three children. They did not sustain any serious injuries, but were taken to the hospital as a precaution. "The police called her parents in China and then her parents called the counselor here in the U.S. and then the counselor in Los Angeles contacted me," ASU Chinese Students and Scholars Association President William Zhu said. He's been working as the middle-man between Tempe police, Jiang's family and her boyfriend. "Her boyfriend is also a sophomore student majoring in communications," Zhu said. "I talked to him this morning on the phone. Looks like he's in shock." "Regarding yesterday's incident where ASU student Yue Jiang was killed, we just want to say that fellow students are being encouraged to talk with counselors, and that our thoughts and prayers are with the student's family."